France is one of the biggest foreign investors in Egypt, with investments worth over 4 billion euros, Al-Ahram Arabic website reported Egypt’s investment minister as saying on Tuesday. There are more than 160 French companies working in Egypt with investments worth 4 billion euros, Minister of Investment and International Cooperation Sahar Nasr said at the inauguration of an economic forum on the future of economic relations between the two countries, held at the Arab World Institute in Paris. In attendance were French Ambassador to Cairo Stéphane Romatet, French Deputy Finance Minister Delphine Gény-Stephann, and the institute’s head, Jack Lang. In her speech to the forum, Nasr said that the economic cooperation portfolio between the two countries was worth 1.5 billion euros, in addition to a joint program with the EU that is worth 1 billion euros. The ministry is working according to the directives of the political leadership, Nasr said, to support economic relations, not only through French development projects in infrastructure but also through private French investments. The 160 French companies operating in Egypt work in fields including infrastructure, transportation, industry and telecommunications, she said. 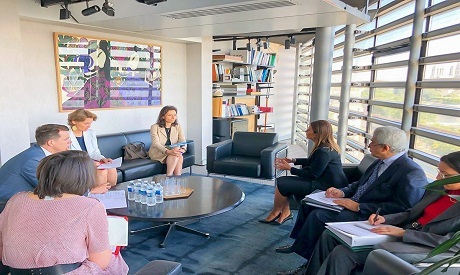 Nasr also discussed with Gény-Stephann how to increase economic and investment cooperation between the two countries, especially in the fields of energy, health and electricity.